As regular readers of my site know, I write about my views of life while managing two chronic conditions: Ehlers-Danlos Syndrome and Charcot Marie Tooth disease. I write about what triathlon – and specifically paratriathlon – has brought to my life in terms of giving me a goal-oriented way to manage my health. And in past years I have spoken of and featured some incredible people on my site. I’ve teamed up with my friend Kendra from Strength/Flexibility/Health/EDS to shine some more light onto stories of hope, strength and perseverance – no matter how big or small the accomplishment. Many times, taking a few extra steps each day or taking a shower is as of big of an accomplishment for some as finishing a triathlon is for others. Within our community (meaning the EDS & chronic medical condition community) it’s important to support those who are fighting against tremendous obstacles to find the right diagnosis, to support those who are battling against incredible odds to find proper medical care, and especially to support those who are fighting to survive every day. AND, it’s equally as important to recognize and support those who have remained focused on the positive, despite incredible obstacles. It’s especially critical to cheer on those who are pushing the limits of what they CAN, as well as those who are finding out how to persevere in other ways. I don’t think many people know of all of the incredible athletes we have in our community — Allysa Seely is one of them. 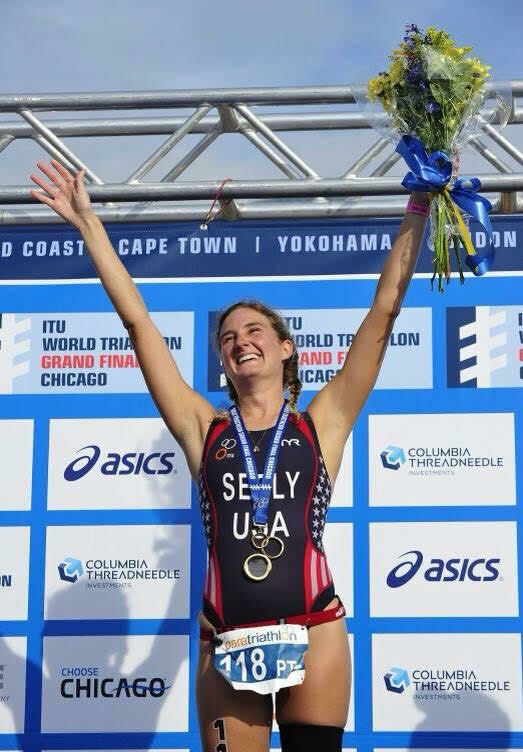 Allysa Seely is an elite paratriathlete representing the USA and working towards her dream of the Rio 2016 Paralympics. After her first triathlon in 2008 she began to lose sensation in her legs, and she began a two year process of figuring out what was happening to her body. In 2010 she was diagnosed with a Chiari 2 Malformation, Basilar Invagination and Ehlers-Danlos syndrome, and soon after had brain and spine surgery. After being told she would not walk again, Allysa worked her way back to compete in triathlon, with her first race post-surgery at Collegiate National Championships in 2011. After her success in rehabilitating from traumatic brain injury, extensive surgery, and racing again, Allysa faced another challenge in 2013 when the neurological damage to her left foot led to her decision to have her leg amputated below the knee. She went on from this to win the 2015 Paratriathlon World Championships in her category, PT2 (the most severely impaired paratriathletes who do not use a wheelchair and who are not visually impaired). I make a choice to find happiness in every experience, this is not to say I have not gone through my fair share of struggles. Some days I feel like I have had more than my fair share of struggles, but I also realize how incredibly fortunate I am. I have had bad days, bad races, made silly mistakes that have cost me, I have struggled with a chronic and progressive illness among other health issues, and I deal with chronic pain day in and day out. None of this is ever easy, but because of my bad days, I appreciate the good and even the mediocre. More than that I make a choice to be proud of everything I have accomplished, everything I have learned from my mistakes and my bad days. I make a choice to find the best in every moment. I make a choice to not make excuses. I make a choice to be happy because at the end of the day why not be happy and grateful. Am I perfect? No, of course not, but my life has been imperfectly perfect. Allysa’s first chance to secure a place in Rio 2016 Paralympics is this weekend on March 13th in Sarasota Florida at the Continental Americas Paratriathlon Championships. The race in Sarasota may be Allysa’s biggest race ever, as she needs a win to ensure she will compete in Rio. She faces stiff competition from former PT2 world champion and above-the-knee amputee Melissa Stockwell. Sadly, we’ve heard people within our community dismiss the success of other EDSers by suggesting that their success is because they don’t suffer as much, or are only “mildly” affected. Both statements could or could not be true, but who are we to judge the suffering of someone else? How do we know how much someone suffers? Solely by judging the way they look? Or by deciding what someone can and cannot do – what someone should or should not be able to do who has our same chronic condition? Isn’t this the exact battle that the chronic/invisible illness community struggles with daily? If so, why would anyone subject individuals within our community to the same judgment we seek to eliminate, especially if their stories provide hope and something positive to read to balance out the sad? Stories of perseverance from either the athletes with Ehlers-Danlos Syndrome like Allysa do not discount the very real struggles and devastation that some in the EDS community face. These stories will not change another EDSers diagnosis – but the stories of strength and triumph bring us hope and a ray of positivity in what can sometimes seem insurmountable. As a community, we need to ensure that we both support all struggles AND that we celebrate all triumphs – big and small. Good luck Allysa – we are all cheering for you! Allysa is a good friend of mine, one of the first paratriathletes I met at the 2012 US Paratriathlon national championships, and a constant source of advice and a great sounding board as I work my way through my own training and issues. She stayed with us during her 2015 season which brought her to London for the world series race in May. Felix, our dog, fell in love with her too. All of us – and especially Felix – wish you the very best this weekend Allysa!